If it’s artificially colored, don’t buy it. You wouldn’t buy wine that said ‘colored with FD&C so-and-so’, would you? Same goes with absinthe. If it’s artificially colored, it stands to reason that it will be of lower quality. Any brand labeled for U.S. sales must state on the label whether it has artificial coloring in it. A distilled, naturally colored absinthe will say something like: “Grain Neutral Spirits (or grape or beet, etc etc) distilled with herbs and colored with herbs”. An artificially colored absinthe will say somewhere on the label “Contains FD&C so-and-so”. Keep in mind there are also clear absinthes, which do not go through the additional coloration step. These are known as La Bleue or Blanche style absinthes. Most absinthes sold in the U.S. will have some telltale signals as to which production method was used to create it. Distilled absinthes tend to be of higher quality, whose labeling is mentioned above. A label example of compounded absinthe (made by adding essential oils to the base alcohol instead of distilling the herbs) might say “Grain Neutral Spirits with Natural Flavors Added”. CAVEAT: Some traditionally colored and distilled absinthes may have ‘natural flavors added’ on the label as well, so this shouldn’t be the be-all-and-end-all point to consider. Macerated absinthes (those that have herbs soaked in alcohol and not redistilled) label might say something like “Spirits with Herbs added”. Macerates have very little in common with authentic absinthe. Products that tout thujone content are looking to make a buck off of the drug culture, trying to promote absinthe as something other than alcohol. Any references or comparisons to other drugs such as cannabis should also show you what the producers are focusing on. These products should be avoided if you’re looking to buy historically accurate absinthe. 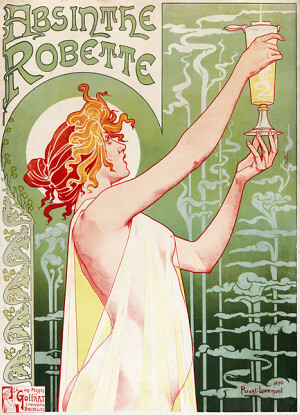 Absinthe is a dry spirit, with sugar added at the discretion of the consumer. It should NEVER be bottled with sugar added. A telltale sign that it contains sugar will be the word ‘LIQUEUR’ on the label. In the US, this signifies added sugar. So, in short, when you’re looking to buy authentic, historically accurate absinthe, examine the label. Buy distilled absinthe that is either clear or naturally colored with herbs with no sugar added, and which employs truthful advertising. If in doubt, or if you’re buying from overseas where the labels might not need to carry the same disclosures, ALWAYS try use the review section of the Wormwood Society, located on the main page of the website. If a product isn’t listed, ask about it or search for it in the forum section of the site. Just because it isn’t listed doesn’t necessarily mean it’s bad. We just might not have gotten around to adding it yet. Members are always happy to help.